The annual ritual of removing illegal immigrants from the bottom of our boat was due again. To be fair, but don't pass this on to all the barnacles and mussels in Conwy river, our Westerly Griffon is the actual immigrant as I am sure barnicles were invented before 2012. But as we posess superior technology, the natives had no choice and were to be relocated. Ronald Donker, my old Dutch friend from days back at secondary school kindly came over for help. So we arrived on Tuesday morning early to take Anyway to the quays, dry out, spray the hull clean with a pressure hose (superior technology part) and put a fresh layer of immigrant unfriendly paint on her bottom. That was the plan, but the plan didn't agree with us. Firstly, when arriving on Anyway and attempting to start her, she coughed once or twice and then went silent. We appeared to have made an intense study in the past month of the depth of our mooring during various tides and moon changes, while leaving the battery on and the depth gauge in an endless discussion with he sandbank below. The end result was an empty battery. So we rowed back to the quays were the habour office borrowed us a Power Pack which was very persuasive to our engine and it sputtered into life. Good, progress. Next we waited for the water to disappear, pushed Anyway away from the quays in the last minute to create enough of a gap to be able to get inbetween with the spray hose. We picked up the power hose from the harbour office, but it showed a similar response as the battery had done earlier in the morning: a brief spray changing into a dribble. Dribbles are not persuasive against the immigrants. On the contrary, they probably relish it although one or two might protest us using this tasteless sweet water. After trying various things our conclusion was the water pump was gone and we had no option to hire one. That wasn't easy, as the model from the hireshop had a very short hose, which would never reach the boat. We hired it under agreement to get a refund if it would not provide a solution. First we noticed that the harbour office spray hose would fit on the loan machine. This was good news but when we tried this, the same pityful spray came out. Ok, a problem with the feed then. After replacing the hose connection to the tap and giving the tap a kick or two, we had lift off. Great, only lost another 2 hours. We returned the loan machine and started cleaning the hull. 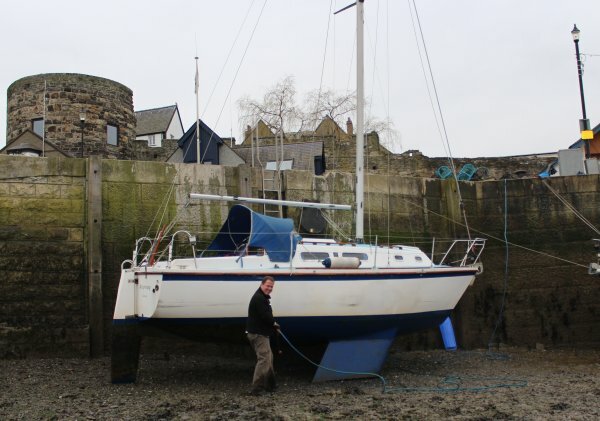 There was not enough time to get a fresh coat of anti-fouling paint on before the tide returned so it had to be tomorrow. At this time Ronald found out he had to be back earlier than expected in the Netherlands, which meant rebooking his flight that evening, using the NWCC Wifi system. 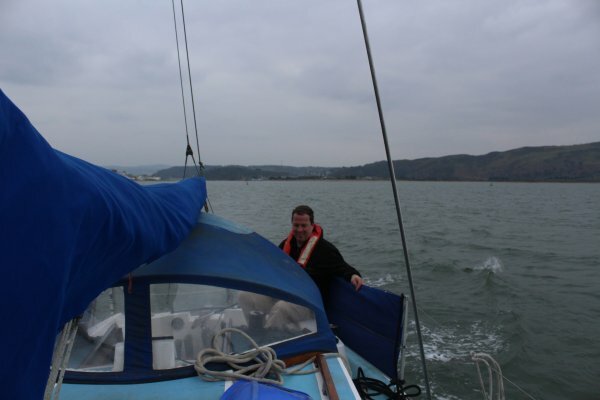 The next morning we still had time for a short sail so we set off at 10:00 and headed towards the Great Orme. I could not risk being late and miss the chance to dry out against the harbour quays. We returned about 11:00 to dry out once more. I had to say goodbye to Ronald and I spend the rest of the afternoon to anti-foul Anyway. Geke promised to pick me up that evening. However, there would only be enough water to float at about 21:00. As we started to float, I untied the stern and bow lines thinking that the line holding us to the quays ladder would be happy to do this task. The current was pushing the stern away from the quays and the pressure on the one remaining line was such that I could not undo it quickly. "Cut the lines" I remember from a pirate movie, which is what I did. We motored back stern first, to avoid taking our neighbours with us. We then motored without incident to our mooring and rowed back in the dark for the drive back home. Done just the absolute minimum in maintenance this year then.